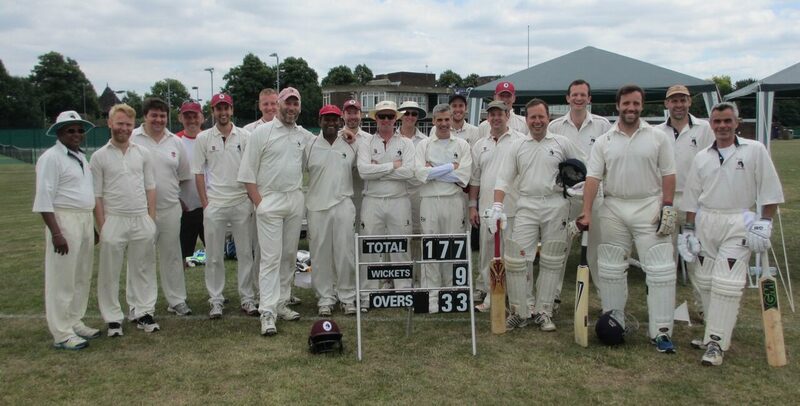 In one on the most eagerly anticipated fixtures of the year the Whalers were defeated by 48 runs by Cheam Baptists. After a full week of email previews, the day dawned hot and sunny, and got hotter. The conditions were ideal for batting on a hard true wicket, and with captain Al Dickenson developing a Nasser Hussein like ability at tossing, he duly called incorrectly and after a moments polite consideration Cheam decided to have a bat. Cheam boasted a strong batting line up, and this was confirmed as they raced to fifty without loss. Mildon and Osgood toiled in the heat, with Osgood beating the bat often but without luck. After a particularly good over of sledging from the slips, Williams provoked a volley of abuse from their number 1, although this had limited effect when it was realised that the only word in his vocabulary was ‘Fatty’. The breakthrough eventually came with the introduction of debuatant Ed Kirkness. Struggling with his run up the number of no balls distracted the batsmen as he was bowled for 41. Spirits boosted the Whalers then enjoyed an excellent period as the runs were restricted and wickets began to fall. Adam Hamner again topped the bowling figures with a quality 3-18, ably supported by the late arriving Paul Osbourn, who picked up 2-14. Captain Al Dickenson held 2 catches in the outfield. However Cheam were confident enough to declare on 183-6 just before tea setting the Whalers a tricky total. Osgood and Pipe opened the batting as cialis vasodilatateur the Whalers sought a solid start. Pipe was first to fall for just 1 , but Osgood batted well for 26. For the first time this season the team faced a twin pronged spin atttack, and it was all too tempting as both Williams and Dickenson were stumped by a country mile, leaving Paul Osbourn to repair the innings with a top scoring 31. Unfortunately Osbourn’s innings was ended as he was caught in front attempting to pull and then it was a regrettably familiar tale as the mid/late order fell away and Cheam’s opening quickie returned for a second spell of 4 -15 with only Mildon providing late resistance with three boundaries. With Humphreys return from injury heroics delaying the finish, The Whalers finished on 134, defeated by a better batting side on the day, reflecting the need for a little more application when batting to enable them to bat oelke tadalafil for 40 overs to achieve the necessary 160 plus scores that win games. The penultimate game of the season will a return fixture against an in form Salix side in Richmond on Sunday August 12th.